It can still take off! The Cannibal Queen™, a 1942 open-cockpit Stearman biplane, hit the sky over Northeast Philadelphia. On a beautiful day in Northeast Philadelphia, a blue, cloudless sky stretched in every direction, and the yellow sun was the brightest object in sight. Until the Cannibal Queen appeared. Powered by her big, 300-horsepower engine, the Queen – a 1942 open-cockpit Stearman biplane – roared into the sky over the Northeast Philadelphia Jet Center, her dazzling yellow paint job putting the sun to shame. As the old bird sputtered to a stop at my feet, a shiny, sleek Lear jet taxied by on its way to the runway. Jim Lonergan – one of the Cannibal Queen’s pilots and owners – removed his flight goggles and helmet and shot the jet a look. Lonergan would know. Since teaching himself to fly in an ultra-light plane that he built from a kit in his living room when he was 19, the 41-year-old pilot has flown a variety of aircraft – from private jets to banner-towing prop planes. But it’s his love of flying in the Cannibal Queen that he enjoys sharing with people, when is why he and his colleagues at the Biplane Rides Over Philadelphia company offer flights to the public. The Lycoming engine coughed to life, turning the propeller into a blur. Soon, the Queen was racing down the runway. Lonergan pulled back on the stick, and we left the world slowly, noisily climbing toward 1,500 feet and making our way toward Center City and the incredible, unique view. He was right. On this particular flight package, know and the Spirit of ’76, the Queen passed over several Philadelphia-area landmarks, including the Ben Franklin Bridge, the Battleship New Jersey, the skyscrapers of Center City, the Philadelphia Museum of Art and Boathouse Row. But don’t be fooled by the simplicity of their name. 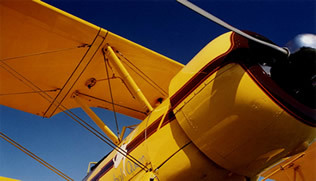 Biplane Rides over Philadelphia offers numerous flight packages, including romantic sunrise and sunset flights, even marriage-proposal flights. The company also offers packages that take in the beautiful countryside and farmland that can be found in Bucks County or the long stretches of sand and surf along the Jersey Shore. “We do a lot of couples. Flying like this – wind in your face, not peeking out from behind a little window – is romantic,” Lonergan said when asked what kind of person is their “typical” customer. Although Lonergan will share his passion – and plane – with anybody, he does have two favorite types of customers: the World War II pilots who actually learned to fly Stearmans in the Army Corps and children. “With kids, it’s just the wonder in their eyes, “ Lonergan said. I was that kid (once), riding my bike to the airport to watch planes take off and land, so I love to take kids up (and) talk to them about flight. That’s the fun part. Lonergan brought the Cannibal Queen back to earth with another gentle landing, and we taxied back to the jet center. Then he commented on the look on my face – a look he calls the “Stearman smile” that all his passengers come out of the cockpit wearing. “Never had a passenger yet that didn’t have that grin on their face!” he said. Lee, an airport attendant, brought the fuel truck over so Lonergan could top off the Queen’s tank. “Man, I love this plane,” the attendant said as we walked around the old biplane together, checking out every little detail, including the leopard print bikini-clad woman brandishing a bone in her hand that is painted on the nose.